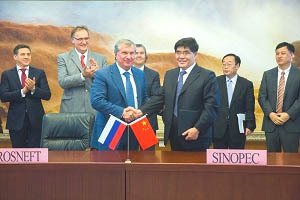 Rosneft and China Petrochemical Corporation (Sinopec) signed the Heads of Agreement on cooperation within the proposed joint development of Russkoye and Yurubcheno-Tokhomskoye fields. The document was signed by the Chairman of Rosneft Management Board Igor Sechin and the Chairman of China Petrochemical Wang Yupu during the visit of the Russian President Vladimir Putin to Beijing and in presence of the President of People's Republic of China Xi Jinping. Under the agreement, Sinopec Group has the right to acquire a 49% stake in East Siberian Oil and Gas Company (ESOGC) and Tyumenneftegaz, that hold the exploration licenses for Russkoye and Yurubcheno-Tokhomskoye fields respectively. Both parties agreed that the two oil and gas fields listed in this new agreement have bright prospects. The two fields are located in one of the key regions of Rosneft operations. Joint development of tight oil reserves will allow Sinopec Group and Rosneft to mitigate the operational risks of the projects. The cooperation will also enhance the projects' capacity in financing, technology and implementation. Both parties look forward to collaborating further on exploration and production.